With the third betas of iOS 9 and OS X 10.11 El Capitan, Apple is introducing a revamped two-factor authentication system, according to both the beta release notes and a detailed support FAQ that outlines the changes. The new two-factor authentication system is different from Apple's existing two-step verification system, using "different methods" to trust devices and deliver verification codes. Apple also says it includes a "more streamlined user experience." Based on the support document, the new two-factor authentication system works similarly to the existing two-step verification system. Any device that you sign into using two-factor authentication in iOS 9 or El Capitan becomes a trusted device that can be used to verify identify when signing into other devices or services linked to an Apple ID. Apple recommends that iOS 9 and OS X El Capitan beta testers using the new two-factor authentication system update all of their devices to iOS 9 or El Capitan for "the best experience." As outlined in the release notes, customers who use two-factor authentication with older devices may be required to put a six-digit verification code at the end of a password instead of using a dedicated verification field. If you enable two-factor authentication, iTunes purchases on Mac and Windows will require you to append a 6-digit code to the end of your password on every purchase. 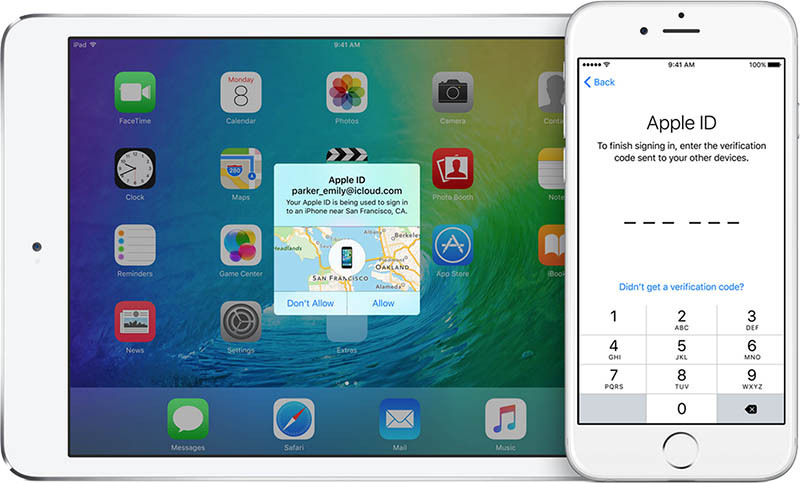 The 6-digit code will automatically be sent to your iOS 9 or OS X El Capitan devices. Older devices are also not able to receive two-factor authentication codes when used with devices running iOS 9 and El Capitan, but customers who stick with the older two-step verification system should not run into any issues as Apple tests the newer two-factor authentication system. Apple does not recommend that customers using two-step verification swap over to two-factor authentication until the feature is available to all. First introduced in March of 2013, two-factor verification is an opt-in system that increases the security of Apple ID accounts. Since its debut, Apple has been working to expand two-factor authentication to cover several different services like iCloud, iMessage, and FaceTime. It is not entirely clear what other changes the new two-factor authentication system brings to iOS and Mac devices, but the switch to a new system may allow Apple to further extend the functionality of two-factor authentication in the future. Update: An Apple spokesperson told Macworld that the troublesome recovery key feature that has caused people to lose their Apple ID accounts in the past has been removed in the new two-factor authentication system. With the existing two-step verification system, either a recovery key or a trusted device/trusted phone number is required to access an Apple ID account. If both should be lost, such as when a trusted device is stolen, an Apple ID is irretrievable. With the new authentication system, Apple's customer support team will help users recover their Apple IDs through a recovery process should both trusted devices and phone numbers become inaccessible. If you can't sign in, reset your password, or receive verification codes, you can regain access to your account by requesting account recovery. Simply provide a verified phone number where you can receive a text message or phone call regarding your account. Apple will review your case and contact you at the number provided when your Apple ID is ready for recovery. The automated message will direct you to iforgot.apple.com to complete the required steps and regain access to your account. Account recovery will take a few days—or longer—depending on how much information you can provide to verify that you are the account owner. The process is designed to get you back into your account as quickly as possible while denying access to anyone who might be pretending to be you. As noted by Apple, not all beta testers and developers will have access to the new two-factor authentication system right away, but Apple plans to add additional testers gradually as we get closer to the release of iOS 9 and OS X El Capitan. The fact that people are involved isn't what concerns me. What concerns me is that for this to work Aplle must retain the ability to access your account, meaning they can be obliged to access your account by the American government, and people hacking Apple can access your account too. This I bad news. Remember when Apple were promoting the fact that if the NSA asked for access to your account Apple were unable to comply even if they wanted to? Clearly this is no longer the case. This, a thousand time this. Apple being able to provide access to your account means apple holds the master key to unlock your account. This is a blow to us who rely on Apple for privacy as it's allows open season access for the US Govt or clever social engineers. Good, app specific passwords, two factor authentication, etc as it is right now is just confusing as all hell. It took me like 30 minutes to sign into imessage on my mac because of the app specific password crap. It was a PITA to set up. Why are they involving humans in recovery process yet again??? Did they not learn from the infamous 2012 case??? Leave it 100% to machines!! Humans can be easily manipulated. Agree. I have to complete the App Specifice passwords things so often I wonder how I would recognize if they were bogus pfishing attempts. Did you just post two different articles on macrumors.com that started with the same introduction?! Recycling at its heights, journalism at its lows. Those two posts were written simultaneously because they were interrelated and it was at a time when we were doing a million things at once. I didn't mean to word them exactly the same way though, so I apologize for that, and I've changed the beta post. Sometimes when you write, you skip over whole words and phrases when you read it back to yourself and repetitive bits like that can go entirely under the radar. Sorry for the brain fart there. By the way, if you see a typo or a title/phrase/word in a post that you have an issue with, you can email us and it'll get our attention faster. It sometimes it takes me awhile to get back to the comments on a post when it's busy. tips at macrumors.com or juli at macrumors.com. they need to relax on the rate limiting of attempted verification codes. i called in on Apple Support, they told me to turn off icloud and turn it on. when turning back on, I needed to send a verification code. verification code never got send to my SMS or my Google Voice, never got pushed to my iPad, and then i tried my iPod touch but the verification process said I was attempting too many codes. Apple still refuses to use my Google Voice # for authentication purposes. Not real enough for Apple, but I use it daily. Ah well. I'm guessing they take advantage of email -> text addresses provided by phone carriers. Unfortunately, Google has not made this available for Voice. I'd use it in a ton of places as well. As for having the ability to have them to let you back into your account in case you're locked out, I hope that isn't a requirement for everyone. As someone who operates rather securely, if I screw something up and lock myself out, I want that data to be completely inaccessible. I do not want Apple retaining a secondary backup key to access my information; only I should have the key. Though, not everyone is comfortable with the potential loss of data, which is why it should be an opt-in feature. Don't they already have access to your passwords though?... I don't get the concern. You make an account WITH Apple. They obviously have your password somewhere whether you have 2-Step Verification or not. The entire point with secure password management is that the service provider doesn't have to know your password. They only need to retain the result of a mathematical function where your password was one of the inputs. What Apple have allowed users to do up until now, is to say that "I'm a responsible person and I want to take full responsibility for owning my own 'master key' even if it means that my data will be lost if I lose most of my devices plus this master key." This new two-factor system seems to show that they're moving to a less privacy-centric model, switching to a system where they, not you, own the master key, at least for those who adopt the new style authorization system. In other words, Apple puts themselves in a position where they have the ability to give away your private data to third parties. If the old system was as safe as they claimed it was, then they won't be able to unlock data for those who refuse to upgrade to the new system, but any new customers will likely be forced to use the new, less private, less secure, system. Yeah, if this is not going to be opt-in/opt-out, then I'm really getting pissed. I'm currently using 2FA with my own master key that they provide during setup process. If this means they can still bypass this (currently or in the future, as the Apple spokesperson stated) then not only is it worthless but it also scares the **** out of me. If "not even Apple" gives you a fully private mobile OS (as they advertise it to be all encrypted and all), then who will? Android (google), windows (microsoft)? What about Tim Cook's statement about charging people while selling devices so they are consumers and not the product or being collected information about? Given the fact Apple advertises their software to be private, this is really really bad news. If true, it's a dealbreaker for me, since the main reason I'm using Apple is because of privacy. I don't want anybody to be able to access my devices/information without me handing all the necessary keys over (aka passwords/PIN's/etc...). No company should have something like a "master-key", unless you specifically ask them to do so. "Saying that you don't care about privacy rights because you have nothing to hide is no different than saying you don't care about freedom of speech because you have nothing to say."